Perennial herb 5 - 50 cm tall Stem: erect, arising from a woody taproot, soft-hairy with appressed straight hairs, becoming more slender and more branched above as lower flowers start to develop. 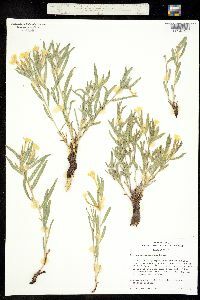 Leaves: numerous, alternate, stalkless, non-toothed, firm, without obvious lateral veins, 2 - 6 cm long, 2 - 6 mm wide, much longer than wide, linear or narrowly lance-shaped, and covered with soft appressed hairs. The lowest leaves are often reduced in size, and there are no basal leaves. Inflorescence: of early-developing, short-stalked, large, showy, bright yellow flowers crowded in axils of upper leaves terminating stem; and later-developing, smaller, non-opening (cleistogamous) flowers in leaf axils further down stem. The larger, showy flowers in the upper leaf axils are mostly sterile, while the smaller cleistogamous flowers below are very fertile, and the plant becomes more elongate and branched as these fertile, but closed flowers develop. 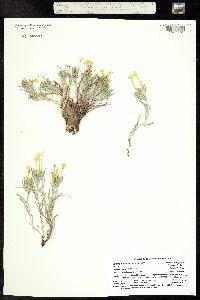 Flowers: of two kinds: early-developing, showy, but mostly sterile, bright yellow, 1 - 2 cm broad, funnel-shaped (long narrow tube and large spreading lobes) with long styles; and later-developing, highly fertile, smaller, non-opening (cleistogamous), tubular, without obvious lobes, but with short styles. 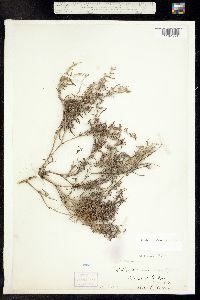 Sepals: five, much shorter than petal tube, narrow, much longer than wide, narrowly lance-shaped with slender pointed tips, and covered with soft, appressed hairs. 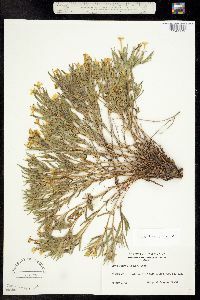 Petals: five, but fused for well over half their length (in showy, sterile flowers) or almost all their length (in smaller, non-opening fertile flowers). The showy but mostly sterile flowers have a 1.5 - 4 cm long narrow tube, which separates into five, spreading, somewhat oblong to narrowly rounded lobes with broad rounded tips, and irregularly toothed or jagged edges. Cleistogamous flowers with small, not obvious, or no lobes at tip of tube. Stamens: five, attached inside near top of petal tube, but the oblong anthers not extending past the petal tube. 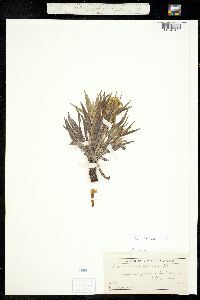 Pistil: with one, deeply four-lobed, superior ovary; one, slender style; and one, distinctly two-lobed stigma. The styles of each flower type are of two different lengths in relation to the stamens (heterostyly): the showy, sterile flowers have long styles; and the non-opening, fertile flowers have short styles; but neither type extends past the petal tube. Fruit: a cluster of one to four, erect, shiny, ivory-white, hard, bony, sparsely pitted, about 4 mm tall, egg-shaped nutlets with narrowed, somewhat pointed tips, and a rounded base with a central, constricted, collar-like rim. The nutlet clusters are subtended by the spreading persistent sepals, and held on mostly recurved stalks. 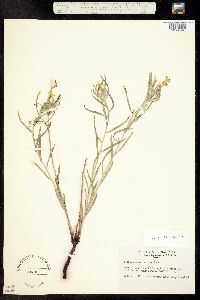 Similar species: Lithospermum incisum is most similar to L. canescens and L. caroliniense, but both of those species typically have spreading hairs on the stems, the leaves are wider (over 4 mm), the petal tubes are shorter (under 1.5 cm), the petal lobes are non-toothed, and the nutlets are smooth and non-pitted. 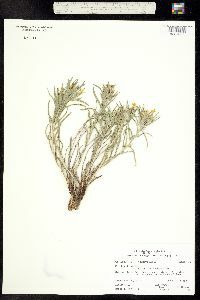 Our other three species of Lithospermum have much smaller and less showy flowers with the sepals usually as long or almost as long as the petal tube, and the sepals mostly remain erect around the fruit. 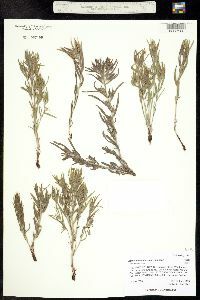 In addition two of those three species have leaves with very obvious lateral veins. Habitat and ecology: Occasional, but localized to dry prairies, or hill prairies in the more northwest area of the Chicago Region. 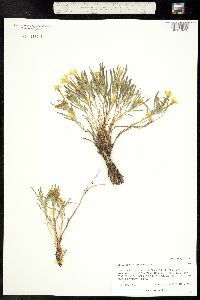 Notes: Lithospermum incisum is more common westward, in dry plains and barrens. It is a bit curious that the showy flowers of this species rarely produce fertile fruit. However, the more tubular, inconspicuous, smaller, cleistogamous flowers which are self-fertilizing produce much fertile fruit. This would seem to indicate that the species is much more successful at self-pollination than cross-pollination or out-crossing. This rare species has been reported from only Putnam, Steuben, Tippecanoe, and Vigo Counties. 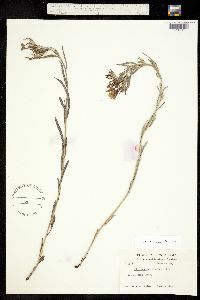 Grimes' specimens from Putnam and Tippecanoe Counties are in the herbarium of DePauw University. Found in sandy and gravelly open places. Infrequent along the roadside southwest of Lafayette, on the gravelly terrace of Big Wea Creek west of the Wabash Railroad.